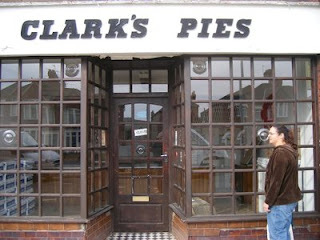 The famous Clark's Pies shop. One of the best foods in the world comes from a tiny little kitchen inside of Clark's Pies, also known colloquially just as "Clarksies", or "Clarkies" in Cardiff Wales. It's famed, and regarded almost as a national treasure by locals. Tom Jones is said to pilot his his private jet in weekly to maintain his heritage by buying a dozen of their meat pies. Since they opened for business in the 1920's they've made one thing, just pies. 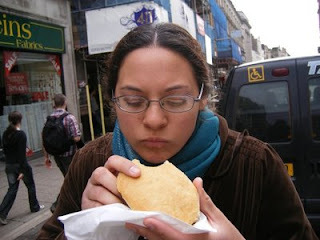 Meat pies that have been baked by hand with century old Welsh recipes. Each a taste of Welsh history. A object of desire mentioned in poems, plays, and history books for over five-hundred years. It's a food that transcends time, and would be just as home five centuries ago as it is today. It's timeless. A typical tourist may not have ever heard of Clark's, yet locals seem to almost base their sense of direction upon the aroma of the meat and onion emanating from the little Canton bakery where they're made fresh each morning. We only needed to ask the public bus driver "where is Clarkies?" to make him turn around to us with a smile and say "Take a seat darlings, and I'll get you there in not time." As if his sole purpose in life was to serve American girls who were keen enough to participate in what can only be called a Welsh baptismal. 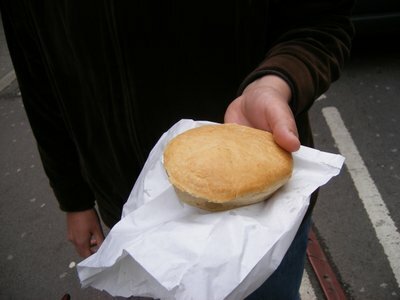 Our entry into the ranks of the Welsh's most treasured meat pies was nearing moment by moment. When we finally arrived our chauffeur who seemed to know everyone on board his bus by first name, leaned over gleaming with pride and pointed to the shop about half a block away. I glanced back only to realize the entire bus of passengers had been carefully listening in on the conversation and were now smiling, even encouraging us on our journey with hand gestures, like we were their children on a rite of passage. Shannon is trying to take it all in. They say to eat Welsh is to be Welsh, but when we arrived, Clark's Pies had already closed for the day. I was saddened and dismayed. I had traveled over three-thousand miles, across three countries, and now destiny had intercepted my right as a descendant of Wales, preventing me from my sacrament of beef and vegetable gravy filled pies of Clarks! Say it isn't so? It was a freaking Welsh tragedy. But not all was lost though, as we soon would find out. 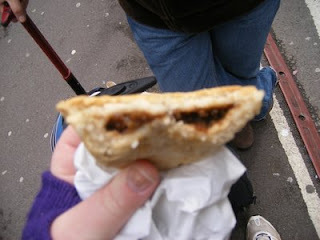 The next day while visiting the Cardiff Market, we stumbled upon a butcher who just happened to be selling.... you guessed it, Clarkies Pies! At just over a £1.50 a piece we waited patiently for them to be warmed in the oven. Again I think we shocked the vendor just by asking for them. The people of Cardiff get real excited to watch people eat a Clark's meat pie for the first time. Like that scene in the 'Wedding Singer' where the grandmother wants to watch Adam Sandler's character eat the meatball. A Clark's Tash - The nickname given to burning the upper lip with the hot filling. I'm sorry, it doesn't get much better than this. No fork needed, you just grab it in your hand and shove it in your (excuse the reference) pie hole. The pie crust is very versatile and handles well without crumbling. The taste is amazing. The crust was buttery and flaky and melted in your mouth. The filling? Like heaven itself. How can something so simple, the art of food, become so lost in America? Here a little meat pie, unknown to most of the world exemplifies exactly what's been lost in our modern society of brand name foods. The predicament of realizing such a thing of course, when you don't live remotely near a Clark's Pies, is that nothing will ever taste quite good enough again.